Once in Madrid locals told me about the “golden triangle” (see link) referring to three famous museums. I argue that Rotterdam has a far more interesting triangle: BAR, Transport Club Rotterdam and Annabel located next to each other (check articles). All can be found a few minutes from Hofplein and Rotterdam Central Station. The name might make you think about just another bar where some locals hang out, trying to get away from their screaming kids, annoying wives or old guys looking for a place to watch some football. Do not(!) make this mistake. 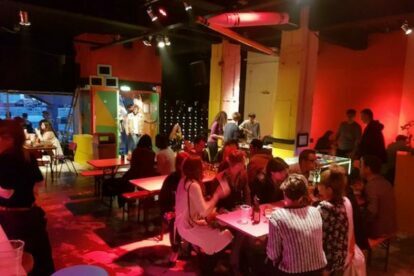 BAR is place filled with young people from all over the city enjoying themselves with a game of foosball, pinball or on the brand-new Pacman player machine. Personally I like to visit BAR after midnight but there is absolutely no reason not to go earlier. Comfy sofas and a cold beer will help you re-energize after challenging the Erasmus Bridge on your bike, of course with headwind. In the nighttime BAR turns into a great place to party! Various national and international DJs (house/techno/etc.) have visited BAR and turned the place into the hottest club in town. If you ever visited Japan you’re into Karaoke, find it at BAR every Wednesday evening. To see what parties are coming up check out their website. The venue is free of entrance till around 22:00, after which you have to pay a modest entrance fee (€5 – €10).